As a teen, I had a real passion for fried rice and, since I was a vegetarian at the time, I thought that ordering takeout Chinese vegetable fried rice at least twice a week was a fairly healthy choice. I could literally eat an entire takeout container and call it dinner. Now that I cook at home more frequently and often have leftover rice, I find that making my favorite takeout dish at home is cheap, healthy and delicious. The trick to making the best fried rice is to use day-old rice that has been in the fridge and slightly dried out. My version is made with hearty short-grain brown rice, and gives you two servings of vegetables (which usually means about half a cup). 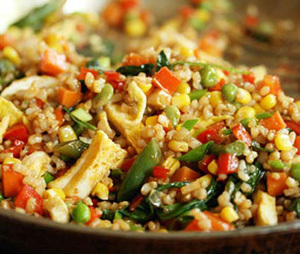 Try my latest recipe on AOL for homemade vegetable fried rice! So what’s the deal with monosodium glutamate (MSG)? Restaurants tend to use MSG to enhance the flavor of saucy meat and vegetable dishes. Sodium glutamate is the salt of glutamic acid, which is one of the body’s 20 amino acids. Curiously, when we eat food with MSG it creates an “excitatory” feeling on our tongues, like a little party for your taste buds that makes the food taste more savory. Health experts say that most people don’t suffer any harmful effects from it (given that it already exists in your body), but excessive consumption of MSG can cause allergies, severe headaches and fatigue. However, it’s easy to avoid MSG – try cooking your Chinese favorites at home using flavorful aromatics like ginger, garlic and scallions.